This section features points of interest for Santa Barbara County, including historic State Street in downtown Santa Barbara, popular Stearns Wharf, area parks and beaches, Santa Barbara Wine Country, a wide selection of attractions, and a list of popular accommodations. Santa Barbara's downtown State Street features boutique shops, restaurants, sidewalk cafes, art galleries, upscale shopping areas, and historic sites. The Downtown Santa Barbara area is also a historic district featuring art galleries, cultural venues, museums, and more. State Street offers about seven miles of fine dining and shopping. Just east of Carrillo Street are El Paseo, the city's first shopping center dating from the 1920s, on the north side of State Street and Paseo Nuevo on the south side of the street. Juse West of Carrillo are Victoria and La Arcada, a unique architectural gem with a very cool street-level courtyard and featuring many of the city's top restaurants and art galleries. Uptown where State Street runs back into US-101 are La Cumbre and Five Points. A few miles east, the town of Montecito features Coast Village and Montecito Village. See below for restaurant suggestions. A shuttle bus takes visitors between downtown and historic Stearns Wharf, the most visited attraction in Santa Barbara. The wharf which dates from 1872 offers harbor cruises, restaurants, and unusual specialty stores above the water, even wine tasting. The Santa Barbara Museum of Natural History has its Ty Warner Sea Center on the wharf. Open daily, it features hands-on exhibits and a 39-foot life-sized model of a Gray whale. Map and Directory of Stearns Wharf (Printable PDF file). The Santa Barbara area offers numerous beautiful beaches. Largely south-facing, the beaches are sheltered from the prevailing west winds and offer exceptionally comfortable recreation. East Beach (the main center of activity) and West Beach are on either side of Stearns Wharf. Leadbetter Beach and Park is to the west of Santa Barbara Harbor. Arroyo Burro Beach is several miles west of the harbor and more secluded. All have numerous activities, amenities, and events. Chase Palm Park, behind East Beach, features various events, and Sunday arts and crafts shows. There are excellent paths for walking and biking especially in the central area around Stearns Wharf, East Beach, and West Beach. There are miles of well-marked off road bicycle paths throughout the area, as well as several places where bicycles may be rented. Read Bike Along the Santa Barbara Waterfront(Printable PDF file). West of Santa Barbara and Goleta, the main route, US-101 hugs a very beautiful and undeveloped section of coast for about thirty miles. The coast features three outstanding state park units, El Capitan State Beach, Refugio State, and Gaviota State Park. All offer outstanding beach recreation and camping. Gaviota (whose entrance is a few miles north of the coast) also offers hiking and recration in the foothills behind the beach. For complete details on all park units as well as camping, read Santa Barbara State Parks and Beaches. Santa Barbara Wine Country offers some of California's finest wines with nearly 100 wineries and shops where you can taste, enjoy, and purchase a wide variety of wines. The heart of wine country is around the towns of Buellton and Solvang in northern Santa Barbara County. This area is reached in under an hour via the scenic coastal route, US-101 north. A slightly longer route via highway CA-154 through the mountains via scenic Lake Cachuma offers a very nice alternative. Wine country offers an excellent selection of inns and restaurants. For those wishing to stay around Santa Barbara, the Urban Wine Trail offers about a dozen shops featuring local wines. Six shops are clustered within a few blocks walk of Stearns Wharf just north of Cabrillo Boulevard. One is on State Street and five are on Anacapa Street a couple blocks away. This is an excellent opportunity to sample wines without driving your car. Downtown Santa Barbara - Urban Wine Trail. Map includes details for each shop. Santa Barbara Wine Tasting: Urban Wine Trail. Map includes details for each shop. Santa Barbara on Foot - Red Tile Walking Tour of Historic Landmarks - (Printable PDF file). The fascinating Santa Barbara County Courthouse, has been called the most beautiful government building in America, and free docent guided tours are offered daily. The highly regarded Santa Barbara Museum of Art exhibits range from Greek and Roman antiquities to 19th century European to contemporary works. Permanent and changing exhibits. Mission Santa Barbara has been called the "Queen of the Missions" and is one of the best preserved of the early missions. See our section on Spanish Missions in the county. The Santa Barbara Zoo is known as one of the world's most beautiful zoos, located on thirty acres of lush botanic gardens overlooking the Pacific Ocean. Inn of the Spanish Garden is a luxury boutique hotel located in downtown Santa Barbara, California, just three blocks from State Street shopping and dining. 23 guest rooms/suites on 2 floors. Smoke free premises. Outdoor Pool, fitness center, Complimentary breakfast, Complimentary newspaper, Free wireless internet. This Spanish Colonial-style luxury resort is located in Montecito, CA, directly on Butterfly Beach. The Santa Barbara Zoo is 1.5 miles from the Four Seasons Santa Barbara. Mission Santa Barbara is about 4 miles away. 207 units. 185 standard one-bedroom units, 22 one-bedroom suites on 2 floors. Smoke free premises. 2 Outdoor Heated Pools, 3 Hot Tubs, tennis courts, croquet lawn, putting green, full service spa, Wireless internet (fee), Parking (fee). Situated in Santa Barbara, Pacifica Suites is close to Goleta Beach and University of California-Santa Barbara. 87 one-bedroom suites on 2 stories, Designated smoking area. Heated Outdoor Pool and hot tub, use of nearby fitness center (discount), Complimentary breakfast, Free wireless internet. Conveniently near the airport in Santa Barbara, Bath Street Inn is close to Santa Barbara Symphony Orchestra, Mission Santa Barbara, and Presidio Santa Barbara. 12 standard one-bedroom units on 3 stories (no elevator), some with kitchens and/or whirlpools. Smoke free premises. Library, Video library, Complimentary breakfast, Free wireless internet. Situated in Santa Barbara, Cheshire Cat Inn is in the historical district and close to Santa Barbara Symphony Orchestra, Mission Santa Barbara, and Presidio Santa Barbara. 17 units. 13 standard one-bedroom units, some with kitchens and/or whirlpools, 4 one-bedroom suites, with whirlpools on 2 stories (no elevator). Smoke free premises. Spa tub, Video library, Complimentary breakfast, Free wireless internet. Situated in the heart of Santa Barbara, Simpson House Inn is close to Alice Keck Memorial Garden, Presidio Santa Barbara, and Mission Santa Barbara. 15 standard one-bedroom units on 2 stories (no elevator), Designated smoking area. Use of nearby fitness center (discount), Video library, Complimentary breakfast, Complimentary newspaper, Free wireless internet. For a more complete listing, please read Santa Barbara Hotels, Bed & Breakfast, Inns, and other Lodging. Visit recommendations: You can spend a day or a week in the area. 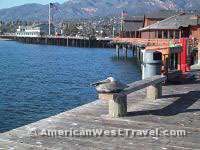 I especially like Stearns Wharf, the Ty Warner Sea Center, the beach areas around the wharf, window shopping and walking on downtown State Street, and Mission Santa Barbara. Plan to arrive early on weekends or in the summer as parking can be difficult. Click Here for the Best Santa Barbara Hotel Deals! Book Now and Save through American West Travelogue. Offers travelers, newcomers, and locals the best, most comprehensive information on what's happening in and around the area some call "the American Riviera". In comparative tastings, wines from California's Central Coast rival those from such renowned regions as Bordeaux, Burgundy, and Napa, yet they also offer superb value. This is the first comprehensive guide to one of the world's most dynamic and beautiful wine regions-and the setting for the award-winning movie Sideways.